Since 1975, there have been several sprawling refugee camps in the middle of the Sahara Desert, 30 miles outside a small Algerian military outpost town called Tindouf. About 165,000 Saharawi refugees live in these camps. They wait for the fulfillment of a promise made 27 years ago. That promise would be a 1991 UN ceasefire agreement to end the civil war that broke out in their homeland of Western Sahara, a former Spanish colony (and now commonly called “Africa’s last colony”). From 1975 to 1991, the Saharawi liberation movement and military front, called the Polisario, fought against Moroccan military occupation and the second “colonization” of Western Sahara by 350,000 Moroccans, who were ordered by the Moroccan king to move into the territory and claim it for the Moroccan state. What has followed is one of the most enduring and intractable conflicts in the world. In 1991, the United Nations brokered a ceasefire agreement to not only end the violence but also include a provision for a referendum of the future of the territory and the creation of a UN body to oversee the referendum. More than a quarter century on later, the people of Western Sahara still await the fulfillment of this agreement, which has been bogged down by a combination of acrid international politics, bad faith negotiations, and near total lack of global awareness of their dire situation. And the Sahara Desert is as hard on cars as it is on people. These 44-year-old camps have provided something of a natural experiment to test the limits of automotive durability. The arid hammada gets 5 millimeters of rain per year (usually all at once as a flash flood), summer days reach 125F, and the wind sometimes whips through fast enough to rip the roofs off the mud brick homes, carrying tons of fine sand with them. The roads are banked, divoted, washed out, washboarded, full of rocks, and generally rough. Saharawis buy fuel and oil from used coke bottles, often tainted with dust or other unwelcome pollutants. Any car used here has to deal with some of the most unfriendly conditions in the world, or it simply will not survive. The dried out corpses of unfit autos can be seen strewn throughout the camps. Moreover, for a car to be worth the high price of import, it has to be reparable with simple tools: minimal electronic parts, no fancy computerized systems. All cars break down repeatedly in this environment, and durability is defined not only by how often they break, but also how readily they can be repaired. This has led to an interesting market, in which Saharawis value little about a car besides its price and its ability to go and go in the dry, scabrous terrain. It doesn’t matter what it looks like, and it doesn’t matter if the windows roll up and down or if the radio plays. What matters is that it works, and that if it breaks, it can be fixed roadside, with the tools available. In this contest of survival of the fittest in the planet’s most punishing place for a car, there are two clear winners. The undisputed King of the Sahara is the 1970s and ’80s Land Rover Santana and its Series III relatives. These are highly desirable, even at 40 years old and more. 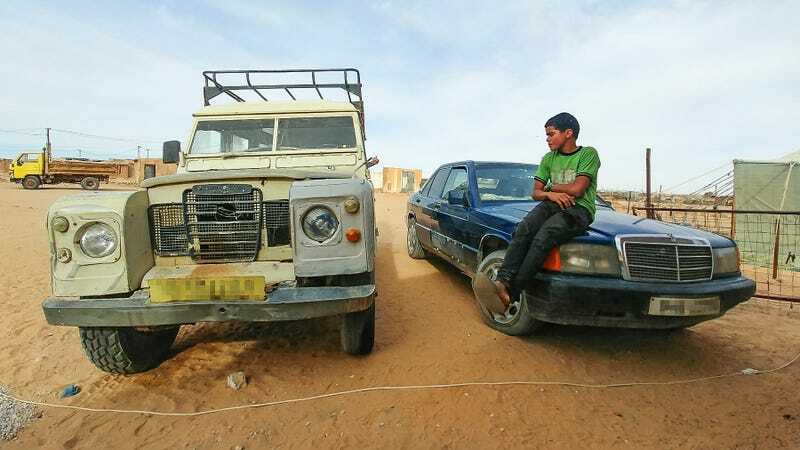 A functional Land Rover fetches around $5,000 in the camps, a true fortune—nearly two year’s wages—for a Saharawi lucky enough to find work. Perhaps unexpectedly, in a strong second place is the early ’90s Mercedes C-class sedan, especially the 180E and 190E, as well as the 200E and E320 models. The hood ornaments and exterior trim are usually torn off, the interior door panels are often long gone, and many appear to be on their third or fourth blanket-upholstery job. But their engines always turn over, sputter to life, and they get down the road. Safety in numbers is the logic here, and this car has proven so tough in this environment that the market has gone all in. An average specimen (and by average, I mean rough shape) with the gas engine will sell for $3,500. The diesels, considered particularly durable, can reach as high as $5,000 or $6,000. These cars are bought in Spain by enterprising Saharawis (with Spanish passports, or at least resident visas), shipped to the Algerian port city of Mostaganem, and one by one driven the 1,000 miles south to the camps. They have experimented with bringing other cars from the Spanish market, but no others have been found to cope as well with the constraints of constant use in the punishing Sahara. In this contest, the Land Rover and the Mercedes C-class are the clear winners, the King and Queen of the Sahara. Joseph Huddleston is a political scientist at Seton Hall University and also a lifelong motorhead. He has been doing research in the Saharawi refugee camps in Tindouf, Algeria, which are in the middle of the Sahara Desert and have been left here by the war over Western Sahara and the occupation of the country by the Moroccan military. His freelance fee for this article was donated to the Saharawi Association of the USA, created to raise awareness of the Western Sahara conflict and irresolution. Please consider visiting their site and learning more about those who suffer from this unresolved conflict. Welcome To Africa, Where Peugeots Never Die!